Singapore is full of surprises. That could be – indeed, I believe it has been – used as a tourist marketing slogan. But while foreign visitors might be surprised at what Singapore has to offer (I saw one tourism promotion boasting that Singapore “had the only revolving restaurant in the world atop a flour silo” - wow!!!!!) the biggest surprises come to those of us who live here and like to attend classical music concerts. In an average week I would reckon to attend between 5 and 10 concerts; exceptionally I might attend anything up to 20 or, very occasionally, just a couple. I am not alone. There is a tiny group of dedicated concert-goers who I bump into at various venues and occasionally share frantic journeys across town to get from one concert to another. Like any group of specialist enthusiasts, we share notes, and it’s always good to be able to claim to have visited a concert about which the others did not know. It’s usually one of the others who has rooted out an event the rest of us missed, but now it’s my turn; I found a concert last night which none of the others knew about. In a very large audience, I recognised none of Singapore’s habitual concert-goers or high-profile classical music enthusiasts. While it might be a boast for sad, boring souls like myself, on a serious note, Singapore’s pathetically and chaotically ad hoc concert scene is a national disgrace and substantially undermines the state’s credibility as a cultural hub. There may be much going on, but if nobody knows about it, what purpose does it all serve? Perhaps the problem stems from Singapore’s uncontrollable obsession with social media. (This is a terrible misnomer, since in effect it is a wholly anti-social media. The sight of every single local totally engaged with their media devices on the MRT, the bus, walking in the street or sitting in a café oblivious to their surroundings and those physically close to them, creates the impression of Singaporeans as a rude, anti-social, selfish people whose attitude to their fellow man is one that refuses to acknowledge their very existence. This does not go unnoticed by visitors, but also has very serious social effects at home. I was at a social services presentation yesterday in which the very real issue of families breaking was addressed. A significant contributory factor to this breakdown of family life in Singapore was identified as family members being so absorbed in social media that they no longer interact or share communal experiences.) In the case of concerts and arts events, the appalling belief that reality does not exist beyond the platform of social media, means that those presenting arts events can only perceive of publicity as mentioning them on a social media platform. That was how I learnt about last night’s concert. A couple of weeks back I attended a concert given by the NAFA choir. NAFA are dreadful in their use of social media as a promotional tool. A few days before each event, they post it on some platform or other. I imagine they leave it to the last moment so that, should by accident any of Singapore’s musical cognoscenti notice, it will be too late for them to re-organise their schedules and attend. That’s usually the case with me, but as it happened (and much to NAFA’s chagrin) on this occasion, I was not only free but in that part of town, and went along. I wish I had not. However, a young man sidled up to me as we waited for NAFA to get its act together sufficiently to open the doors to the few social-media harpies who had gathered, and asked me why I had never attended a concert given by Cappella Martialis. My answer was simple. I had never heard of them and never heard of any concert they might have given or were planning to give. Even then, the young man seemed to be very secretive and, rather than hand me any kind of notice about a forthcoming concert, asked if he could “friend” me on Facebook. Now Facebook, as we all know, is merely a way to open our hearts, souls and bank accounts to Donald Trump, Vladimir Putin and the good folk of Cambridge Analytica, and I use it merely to induce nausea at the sight of so many ghastly dogs and cats and so many hideously foul looking plates of food. However, this young man seemed to think it would give him some pleasure, so I accepted. From that day I was bombarded with regular “updates” on a concert held by Cappella Martialis which eventually took place last night. The problem with Facebook as a channel of event publicity is that it has no mass outreach. Facebook reaches just those whom you allow it to reach – your assigned so-called “friends” (another misnomer since most of Facebook “friends” have never met each other in real life). The chances of someone accidentally coming across a post announcing an event in Singapore are slight, and the chances of someone accidentally coming across a post announcing an event in Singapore who is actually in Singapore at the time are negligible. Much better to throw up a few strategic posters here and there (if not quite going to the extremes the Singapore Symphony is currently attempting by draping most lampposts in the city with banners announcing Kavakos and Shostakovich) which will attract the attention of passers-by (those non-Singaporean passers-by, at least, who look up from their smartphones as they go about their daily life), or place a few small notices in strategic locations where concert-goers are prone to congregate (viz. other concerts). But Cappella Martialis had done none of this, and so gave the impression that unless you were one of their select gang, you were not really welcome. Finding the concert venue was a slightly surreal experience. On a wet, chilly and dark Sunday evening I found myself splashing through the dimly lit streets of Hougang in search of the Church of the Nativity of the Blessed Virgin Mary. When I eventually found it, it was like a beacon of joy in a desert of desolation. A beautiful, brightly lit, white edifice, in authentic Gothic church style set back in a sea of relative tranquillity against the ocean of noise and bustle outside. Inside it was a little drab, just plain white walls and a peeling ceiling, with serried ranks of the ugliest and most uncomfortable church pews I have ever encountered in a lifetime of church pew observation. But despite this, it was still very welcoming and had the sense of a true oasis. And it has to be said that the people at the door were most friendly and welcoming, and with a very large crowd in attendance, I suspect that Cappella Martialis not only have a lot of friends, but also a very loyal following. 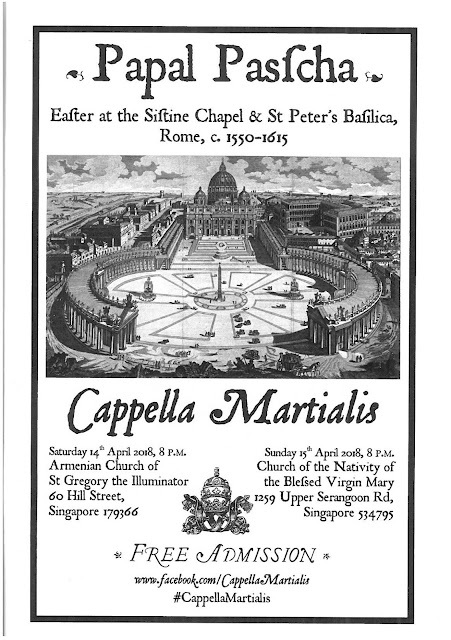 According to the lavish and gorgeously presented programme book (I attach a link to it here - https://www.dropbox.com/s/rvmfp5uxo3wbwa7/Papal%20Pascha%202018%20programme%20final.pdf) – Cappella Martialis comprises 20 mixed voices and is conducted by Goh Hsuanhsuan. They were formed, it would seem, in 2011, with the express intention of performing “lesser-known gems of the early choral tradition…particularly from the Renaissance and Mediaeval periods”. They would seem to have some profound and intelligent scholarship behind them, and ideas on texts, performing practice, historical context and programme building were compellingly presented in a marvellous pre-concert talk. Last night’s concert, which attempted to re-enact the music performed in the Sistine Chapel and St Peter’s Basilica in Rome on Easter Day sometime around the end of the 16th century, included the Missa: Victimae paschali laudes by Giovanni Animuccia (c.1520-1571) as well as various motets, antiphons and psalms by Palestrina, Victoria, Anerio and Razzi. If getting to the concert was a surreal experience, so was listening to it. Never in a thousand years would I ever have expected in Singapore to sit in a traditional church at night, the rain pattering on the windows, the audience feeling snugly cocooned inside, listening to an unaccompanied choir singing this beautiful music with obvious love, care, affection and scholarship. If I were to leave Singapore tomorrow and never come back, it would be the one memory which would remain with me to my dying day. I need write nothing else. This was a lovely event and I am so glad I went. But, like all concerts, there is a tendency to reflect on what might have been done better and therefore made it a more magical experience. And without in any way diminishing the brilliant work of scholarship behind this programme and the dedication and commitment of the singers, I would suggest that there was quite a lot which could have been done to make it truly an uplifting experience. Most obviously, there was a sense that it had not been fully rehearsed as a performance. The programme alternated between the sections of the Mass sung by the whole choir – and here I must praise unreservedly the choir for its fabulously rich and beautifully balanced sound – and chants presented by a trio of men (always beautifully sung). But looking at them as they moved about on the stage was like looking at a flock of sheep in a field with no dog to guide them. They milled around, some heading off in the wrong direction before frantically chasing after the others, several looking around completely lost as if they had no idea what was happening next, and even the trio of men often debating amongst themselves what they were going to sing, where they were going to sing it, and which note they were going to choose to start it on. Goh herself, frantically waving her hand around to try and shepherd her unruly flock into some semblance of order, made no attempt to disguise the fact that she was about to start the Credo before the chanted preface, and her hurried attempt to cancel her downbeat was compounded by the fact that she had sung out the starting notes and then had to re-check them against her tuning fork. Musically she kept them tightly together, but whether to do so using quite such a strict and metronomic beat served the music as effectively as had the scholarship behind the programme planning was doubtful. There is nothing worse than a choir marching on and off stage with military precision, but this choir rambling around like lost sheep was only marginally preferable. A happy medium can be reached – informality with discipline – and creates a much better impression amongst those who are there for the music rather than to support friends. I loved the sound the choir made, but there was always a sense of anxiety at the start due to a number of singers not having really picked up the pitch from Goh’s tuning fork. Why not use a pitch pipe? It avoids all that effort of working out intervallic relationships from an A, it avoids the ridiculous spectacle (from behind) of watching a conductor thrust the fork against her skull, and it provides a much clearer note for the choir to pick up. As it was, there were issues of missed notes and wrong notes – but never an issue of inner tuning or intonation. In short, this was one of the loveliest concerts I have ever attended in Singapore and, Facebook posts or not, this is a choir who I will endeavour to follow whenever they perform since I admire their scholarship, their programming and their collective sound. Mention was made of a further concert in June. Count me in! But as a man called out from the pew in front of me when this forthcoming concert was announced, “Where will it be?”. Once again, it seems, Cappella Martialis likes to shroud their activities in mystery. I can announce it will be on 23rd and 24th June and will comprise “Music of Portuguese Malacca 1511-1641”. But I hope they will try and make the event a little more polished. If any of the Popes in the 16th and 17th centuries had seen their choir showing such complete disregard for the niceties of ceremony and decorum as was evident last night, I fear the music of the Roman Catholic Church would have disintegrated long before it actually did. Constructive criticism at its best. Wrapped in an amusing anecdote. Thank you for this. Whither Goest Thou, 21st Century Music?